There is nothing like a magical winter wonderland feel to your festive decorating, to really get you in the mood for Christmas! 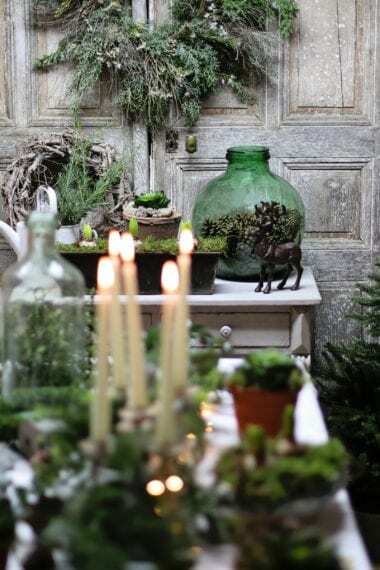 Collette kindly invoiced me back to her studio, to style up some wintery Christmas vignettes. We decided to go for a whimsical feel, with lots of touches of greenery and nature, and ‘bringing the outside in’. 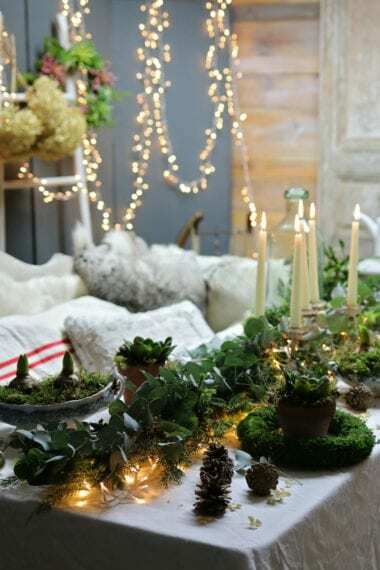 Inspired by some Scandinavian stylist and photographers, we used fairy lights against rustic surfaces, with lots of zinc for a brocante feel. I used vintage French sheets on top of a table, which I then layered up with greenery and candles. 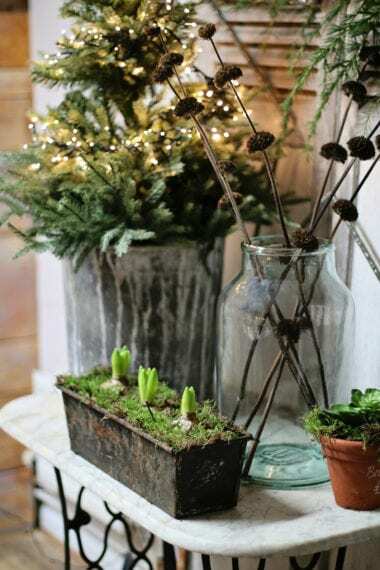 I absolutely love at Christmas to plant up vintage vessels with hyacinth bulbs, which Collette did for me here, in vintage tureens. Hyacinth bulls are in plentiful supply at the moments at market or DIY stores. When I buy them, I gently tease them apart and replant in my chosen vessel. I then add moss around the top for a pretty woodland look. 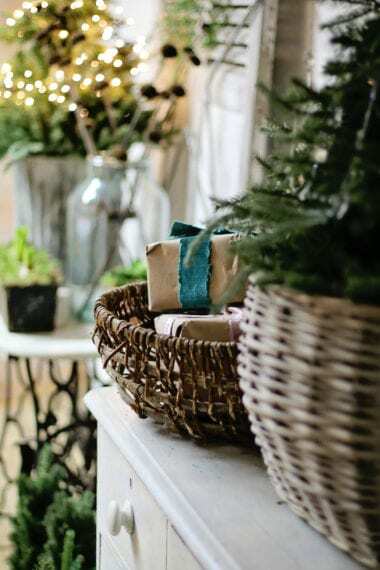 These make perfect last minute gifts, and look beautiful throughout your home. Succulents look gorgeous planted in mini terracotta pots and placed amongst greenery on a sideboard. Believe it or not, the ones here are artificial, and they look amazing! Look out for unusual wreaths for a rustic look. Not only for your front door, they also look stunning on a feature wall, or hanging from reclaimed shutters. 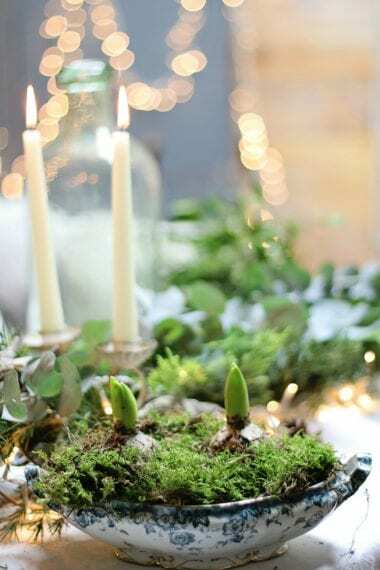 Finally, it’s all about fairy lights, which are pretty much all you need to bring that magical feel to your home, especially the mixed with bunches of dried hydrangeas and pine cones. Warm white fairly lights are the prettiest, and are perfect for draping on the top of mantlepieces, mirrors or on top of tall furniture for a really sparkly look. 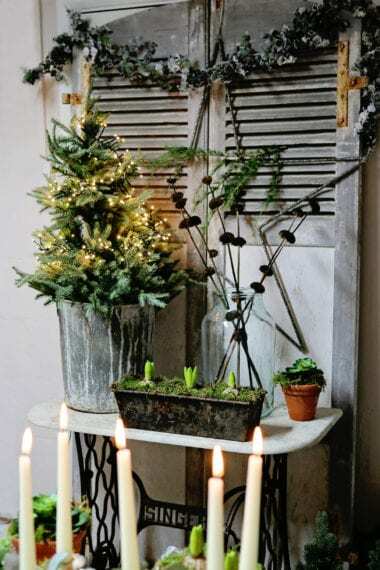 Add elegant taper candles and you really have the magical Christmas feel!